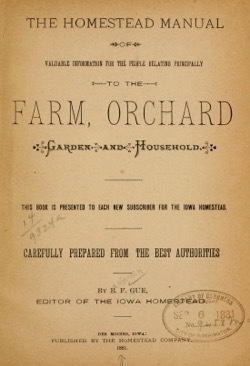 Great care has been taken in the compilation of this book to procure all facts and information presented to the Homestead Subscribers from the best authorities. 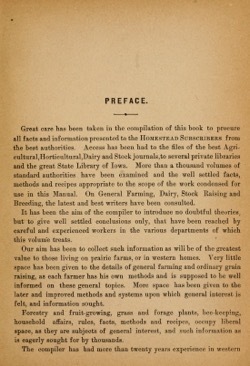 Access has been had to the files of the best Agricultural,Horticultural,Dairy and Stock journals,to several private libraries and the great State Library of Iowa. More than a thousand volumes of standard authorities have been examined and the well settled facts, methods and recipes appropriate to the scope of the work condensed for use in this Manual. On Gleneral Farming, Dairy, Stock Raising and Breeding, the latest and best writers have been consulted. It has been the aim of the compiler to introduce no doubtful theories, but to give well settled conclusions only, that have been reached by careful and experienced workers in the various departments of which this volume treats. Our aim has been to collect such information as will be of the greatest value to those living on prairie farms, or in western homes. Very little space has been given to the details of general farming and ordinary grain raising, as each farmer has his own methods and is supposed to be well informed on these general topics. More space has been given to the later and improved methods and systems upon which general interest is felt, and information sought. Forestry and fruit-growing, grass and forage plants, bee-keeping, household affairs, rules, facts, methods and recipes, occupy liberal space, as they are subjects of general interest, and such information as is eagerly sought for by thousands. The compiler has had more than twenty years experience in western farm management, stock raising and fruit culture, and ought therefore to be able to judge of the competency and correctness of the authorities relied upon in the preparation of this work. 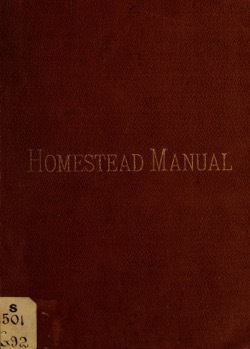 We trust that the Subscribers of the Homestead will find in these pages much of value to every owner of a farm or home. The Household Department has been prepared by ladies who are thoroughly experienced in all household duties, and we are confident that it will be found of great value to young wives and girls who are qualifying themselves for useful and happy lives. 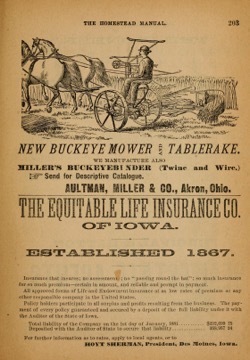 The Horticultural Department is made up largely from a compilation of the published experience of the members of the Iowa State Horticultural Society as gathered and condensed from the valuable Annual Reports of their transactions. Inexperienced persons can rely upon the correctness of the information and suggestions herein contained as relates to varieties of fruit, propogation and culture. We present this volume to the Homestead. Subscribers in the confident belief that it will become a valued and reliable guide on many subjects in which they often need to seek information, and that it will never mislead, but prove one of the most profitable of the many household aids to success. Categorized under: Books, Flowers, Food, Fruit, Garden History, History, Plants.